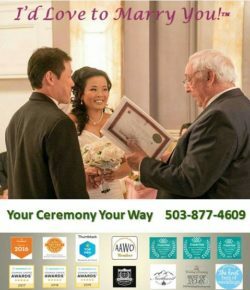 ← Don’t Wait Until the Last Minute to Get the Marriage License! Not having hired a videographer! Yes, you read that right! I had the opportunity to participate in a presentation put on by the folks at WeddingWire.com at a recent networking event. One of the slides showed a typical timeline for hiring the “necessities”: — the venue, the caterer, the photographer, the DJ or other music, the cake, the stationery, the officiant, the decorations, etc., in roughly that order. The videographer was not on the list! Another slide dealt with post-ceremony regrets. Number one? You guessed it — not having a videographer. While still photos are still a necessity, many couples wish that they had video of their ceremonies to share with friends and family who might not have been able to attend, to post on various social media sites and to watch again themselves on anniversaries or when entertaining guests who might not have been invited for whatever reason. So when you are making your “to do” and “to hire” lists make sure that you include the videographer so that you don’t end up having forgotten or deciding not to do so. I’d love to have your thoughts and comments on this blog post. Did you find it interesting? Useful? Length OK? Thanks for reading and responding. I appreciate it.